Soft skills are just as important as hard skills. Whether you’re an optimist pointing to predictions of job creation or you’ve been worrying that a robot might be after your job, one thing is for certain. The world of work is going through a period of arguably unprecedented change at the hands of machines; automation and artificial intelligence (AI) are the new kids on the employment block. Employers need more from their people than ever before if they are to stay relevant and competitive. And similarly, employees expect – even demand – more from the organizations they work for. 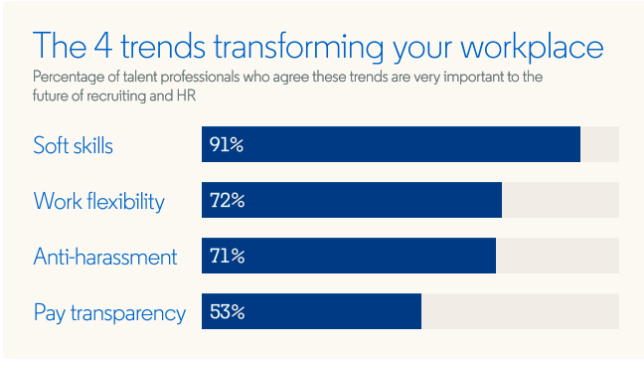 Now, a global survey of 5,000 human resources professionals and hiring managers, combined with behavioural data analysis, conducted by LinkedIn has revealed the four trends most likely to affect the next few years of your career. The term “soft skills” hardly does justice to the complex combination of capabilities it describes: empathy, emotional intelligence, creativity, being able to collaborate and communicate, to name but a few. While they’ve never been the stuff of MBAs and PhDs, soft skills are now more important than ever. So much so that 80% of those surveyed by LinkedIn say they are growing in importance to business success, while 89% highlighted a lack of soft skills among bad hires at their organization. The challenge for employers, however, is that soft skills can be hard to identify in the recruitment process. It’s often only when someone is in-post that soft skills become evident or their absence is revealed. The unstructured, pre-hire assessment of soft skills is a significant problem, with 68% telling LinkedIn the main way they assess them is by picking up on social cues in interviews. That’s an approach that relies on the interviewee presenting an authentic version of themselves, unaffected by interview nerves or excitement, and on the interviewer being a reliable interpreter of social cues. Employers might need to start formalizing their approach to soft skills assessments, by having a clear idea of what skills they need, then using AI tools to analyse the extent to which candidates have those skills. Not that long ago, being able to work from home was rare – and was seen as a huge perk. These days, it’s far more common. Technology is partly responsible for this shift in expectation. From email to instant messaging through to conference calls and social business platforms, staying in touch with co-workers has never been easier. And your location has never been less important. But there are also changes in people’s attitudes toward work. The concept of a job-for-life to which you were thoroughly dedicated no longer really exists. People want more balance in their lives and because there has been so much change and disruption they have learned they need to flexible. If it helps employers attract and keep the best available people, it’s an approach that immediately has a clear business benefit. If you allow people to work flexibly you can also cut costs relating to your office locations. Tech giant Dell is said to have saved an average of $12 million a year with its flexible work programme this way. Employers have a moral obligation to protect their staff from bullying and all forms of harassment. In some cases, they have a legal obligation too. But you need to foster a safe and supportive corporate culture if you want your anti-harassment policies to succeed. Sexual harassment is a blight on the workplace that cuts across every industry sector in every country, affecting people of all income brackets and levels of educational and career attainment. All too often, those who are the target of harassment have found it extremely difficult to speak out. People are less afraid to share their stories of harassment. In 2017, #metoo became a viral phenomenon, after a series of well-known and high-profile women spoke out against men who had attacked and assaulted them. There has been a corresponding increase in people sharing their stories of harassment via platforms like LinkedIn, pushing the issue firmly into the regular workplace. Those individuals and organizations who fail to take measures to end harassment or deal with those who harass others, risk significant reputational harm. 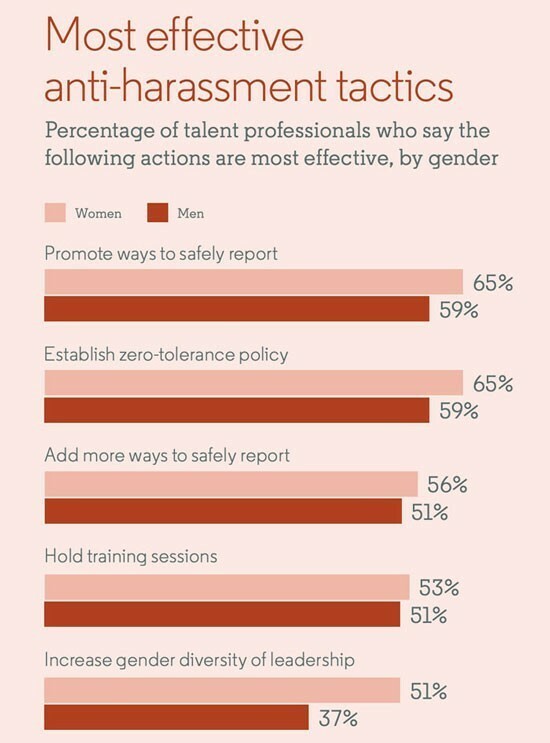 Overcoming harassment and creating supportive cultures calls for a combination of policies and action. Improved diversity and inclusion at all levels of an organization can go a long way to creating an environment where people feel safe asking for help. But ensuring there are constant reminders that staff have recourse and will be supported is hugely important too. Men and women don’t always see eye-to-eye on combating this issue. The pay research organization PayScale asked 93,000 Americans about how well they thought they were getting paid, relative to the overall job market. Two-thirds were wrong with their assessment and most of them believe they are being underpaid. The problem here is that while no one knows what everyone else is being paid, there is a tendency to assume the worst about your own pay rate. That breeds suspicion, negativity, and disaffection. But the trend toward secrecy may be coming to an end. 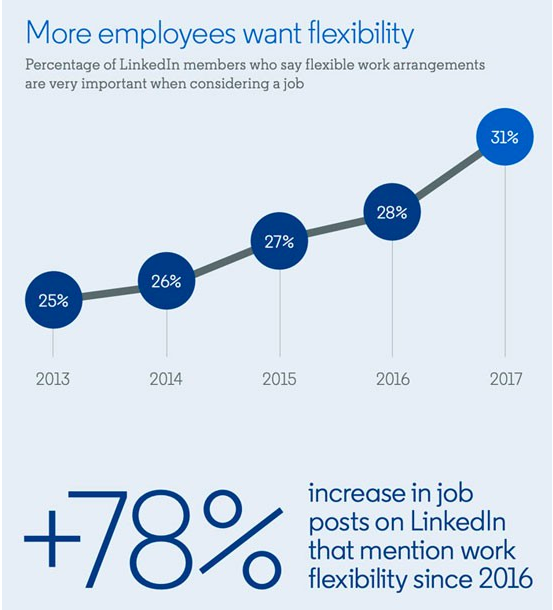 According to LinkedIn, there has been a 136% increase since 2014 in pay transparency in the content shared on its platform. Talking about money can be awkward, but pay transparency can be a good thing. The objective of pay transparency is to ensure everyone is getting paid a fair rate for the work they do. Tackling a culture of salary secrecy – which in the case of the UK involved forcing larger companies to reveal their gender pay gaps – could do much to help reduce inequalities between men and women in the workplace. It can also go a long way to building trust and underpinning diversity and inclusion efforts, as well as taking away some of the time-consuming pay negotiations that take place during hiring. 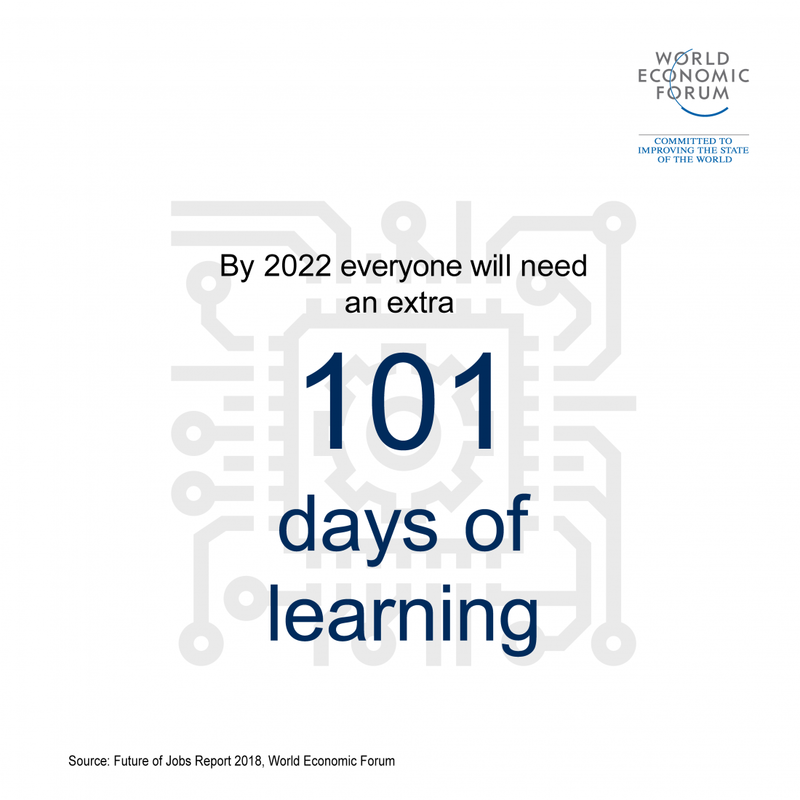 The World Economic Forum's own Future of Jobs report clearly highlights the evolving mix of skills required by companies. By 2022, skills such as analytical thinking and innovation or complex problem solving are all set to grow. This creates a need to reskill the workforces of today, with 54% of all employees requiring significant re- and upskilling by 2022. Unfortunately, the report expects that those most in need are least likely to receive the necessary training. Do you feel ready for the future of work?